Coffee & Chocolate Milk is a collaborative project by married couple Wendy and Kuni. Wendy is a photographer/clay artist and Kuni is a motion graphics designer/illustrator. As two toy lovers who are kids at heart, they decided to recreate their daily moments of married life through the eyes of two toy figures, a monkey and a rabbit, with a twist of humor and imagination. It started as a 365 challenge project and has now evolved into a life journal written in photography and illustration. It has become a project that reminds them why they exchanged vows, and that treasuring every simple moment is the magic spell of happily ever after. The project was named after Wendy and Kuni’s favorite drinks – coffee and chocolate milk. The two drinks they ordered on their first date, and the two drinks that have accompanied them through countless conversations and laughter. 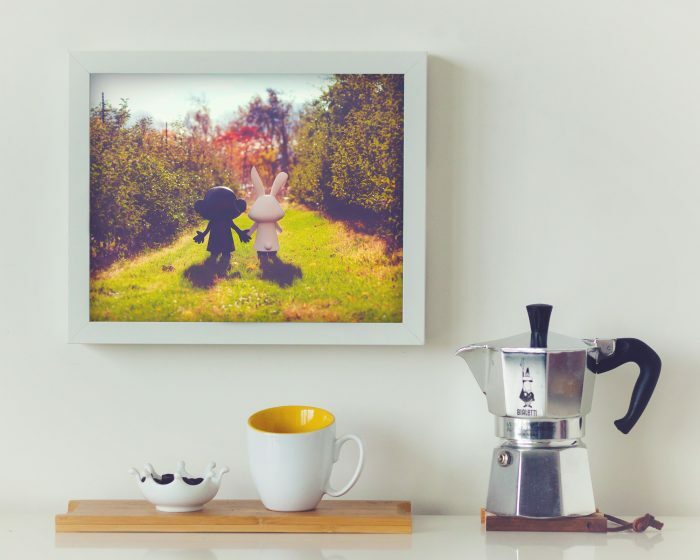 In 2015, Kuni and Wendy decided to create the Coffee & Chocolate online shop with products include prints, stationery and some limited edition clay miniature. They have participated markets and pops up shop since then. The atmosphere the serenity of the holiday always comfort us. We love seeing each others reaction when unpacking the gifts. The project is about love, happiness and moments of life, we want to share these value to everyone. People who love beautiful and adorable images and people who see themselves in our photos.